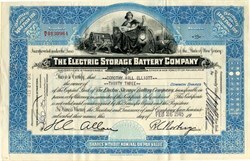 Beautiful certificate from the Electric Storage Battery Company issued in the 1940's. This historic document was printed by American Bank Note Company and has an ornate border around it with a vignette of an allegorical woman holding a light with a little boy on her lap. This item has the signatures of the Company's President and Secretary and is over 57 years old. The Electric Storage Battery Company (ESB) was founded near Philadelphia in 1888. Its Chloride Accumulator Battery helped launch the Age of Electricity. The first Exide (Exotic Oxide) battery was marketed in 1900. The growing company patented the tubular plate battery in 1910, and marketed it as Exide Ironclad. ESB grew dramatically over the years, through product innovation and by expanding the uses for battery power (including separate marketing efforts for automotive and industrial batteries), through purchases of related technology companies such as the General Battery Corporation in 1987, and from numerous corporate changes. ESB eventually became Exide Corporation, which in 1991 sold its industrial battery operations to Yuasa Inc. resulting in the formation of two companies. Exide Corporation (automotive batteries) became a separate, publicly owned company with no further ties to EnerSys. Yuasa-Exide, Inc. (all industrial battery lines, including motive power) was owned by Yuasa Inc. As the final evolutionary step, Yuasa-Exide, Inc., changed its name to Yuasa Inc, in 1998 and finally to EnerSys Inc. in 2000. In March, 2002, EnerSys finalized its acquisition of the Energy Storage products group of Invensys plc., headquartered in Chippenham, England, making it one of the largest battery manufacturers in the world. They operate 19 manufacturing and assembly facilities worldwide, with customers in over 100 countries. EnerSys maintains its worldwide headquarters in Reading, Pennsylvania, USA with divisional headquarters in Europe and Asia.